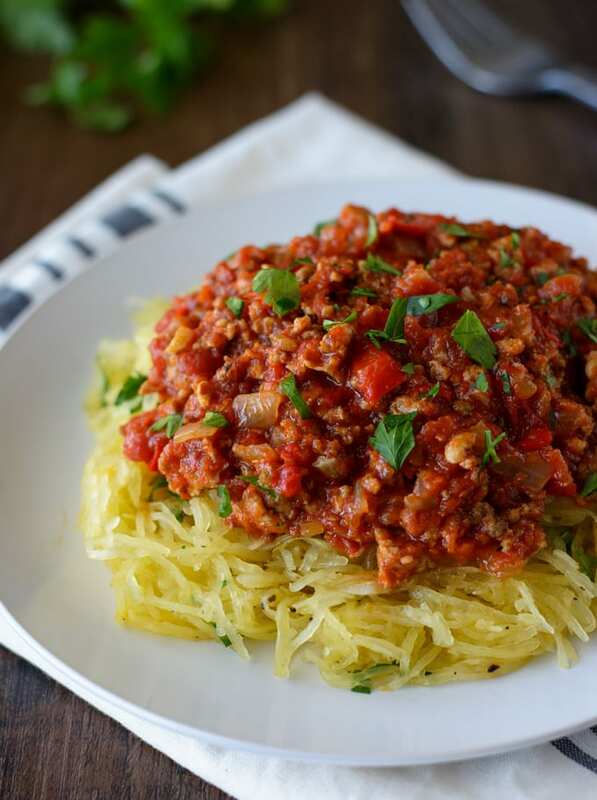 Made with pantry ingredients, this homemade meat sauce is super flavorful and simple to prepare. 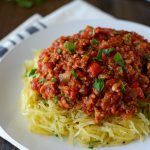 Serve over your choice of pasta, zoodles or spaghetti squash. Sprinkle a little freshly grated Italian Parmesan cheese on top for one delicious dinner! Making a quick meat sauce on the stove is great and all, but letting it simmer away for a few hours helps to really develop those delicious flavors. The only problem is you can’t just leave the house when you do that. So, that’s where the crockpot comes in handy. You can get this into the slow cooker, go do what you need to do for a few hours and come back to a tasty homemade meat sauce! Let the crockpot do most of the work for you! Start by sautéing the chicken sausage, onions and bell pepper. Add the rest of the ingredients except for the parmesan cheese to the crockpot and stir to combine. Cover and let your sauce cook for four hours on low. Moisture doesn’t evaporate in the slow cooker like it does on the stovetop. If your meat sauce looks a little too watery at the end, take the lid off, set it to high and let it cook off some of the excess liquid. Just keep an eye on it, so it doesn’t reduce too much. To help balance the acidity of the tomatoes without adding sugar, you can use some finely grated carrot. I really like the flavor of fire roasted tomatoes in my homemade meat sauce, so that’s what I call for in my recipe. If you aren’t a fan, you could just use regular crushed tomatoes. As I mentioned in my last post, I’ve been serving mine over some of my Oven Roasted Spaghetti Squash lately. You could toss this with your favorite pasta or zoodles (zucchini noodles) if you like. Stove-Top Option – Sauté the meat, onions and bell pepper together until meat has browned and veggies are tender. Add the garlic and seasonings, toss to combine and cook for one minute. Pour in the crushed tomatoes and stir to combine. Bring to a boil, reduce heat and let simmer uncovered for 25-30 minutes while stirring occasionally. Made with pantry ingredients, this super simple Slow Cooker Meat Sauce is super flavorful and simple to prepare. 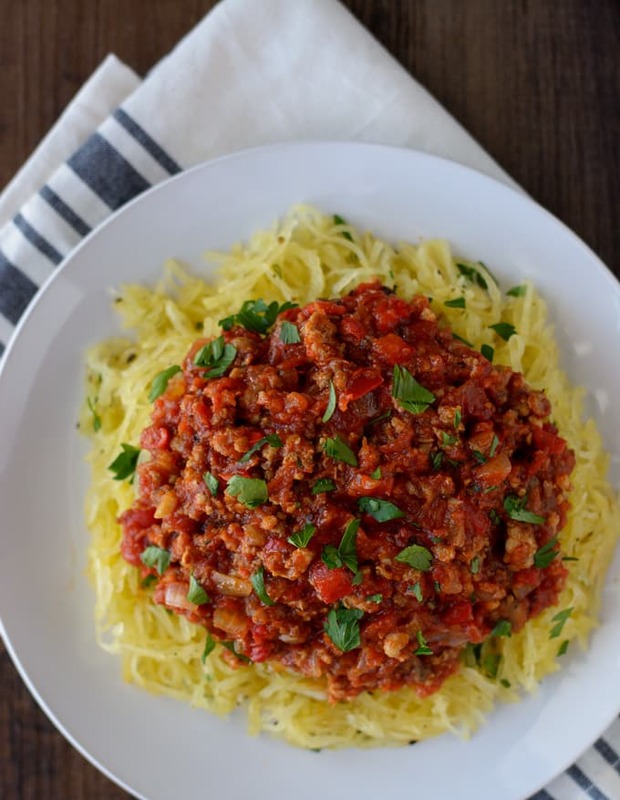 Serve over your choice of pasta, zoodles or spaghetti squash. Heat the tablespoon of olive oil over medium-high heat. Add the chicken sausage, onion and bell pepper to the skillet. Let cook, crumbling the sausage as it cooks, until browned. Place meat/veggie mixture into crockpot. Add the rest of the ingredients and stir to combine. Cover and cook on low for 4 hours. 1.Moisture doesn't evaporate in the slow cooker like it does on the stovetop. If your meat sauce looks a little too watery at the end of cook time, take the lid off, set it to high and let it cook off some of the excess liquid. Just keep an eye on it, so it doesn't reduce too much. 2.Ingredients vary from brand to brand of chicken sausage. I use pasture-raised chicken sausage from my butcher, which doesn't have nutrition info. The estimates below were based on Whole Foods 365 Everyday Value Italian Chicken Sausage. Stove-Top Option - Sauté the meat, onions and bell pepper together until meat has browned and veggies are tender. Add the garlic and seasonings, toss to combine and cook for one minute. Pour in the crushed tomatoes and stir to combine. Bring to a boil, reduce heat and let simmer uncovered for 25-30 minutes while stirring occasionally. Slow cooking sauces like this are just the best, such an intense flavour after cooking. This sounds great. Thanks! It really is amazing how the slow cooker intensifies the flavors so much more!